DISCLAIMER: MAKE SURE YOU ARE FIT AND ABLE BEFORE ATTEMPTING ANY OF THESE ADVANCED EXERCISES. WEIGHT PLATE WORKOUT IS NOT RESPONSIBLE FOR ANY ACCIDENTS OR SELF HARM OCCURRED BY THE USER OR ANY THIRD PARTY. IF YOU ARE UNSURE ABOUT ANY OF THESE EXERCISES, PLEASE CONSULT A PROFESSIONAL BEFORE PARTAKING IN ANY OF THESE EXERCISES. JET SLADE NEWS IS OUT! Gym-Pro featured in Jet Slade: Phase III review. Make sure you build up to a 20kg weight... Use a lighter weight at the start to get use to the exercises. Follow each workout step by step and use the videos as a guide to keep you on track. Once you have completed the workouts, then you are ready to do the circuit for each workout. Have a great workout, get fitter, stronger, leaner and a better body... Good luck! Weight Plate Workout:Exercise 1-7 Then Circuit One. STANDING SINGLE ARM PLATE PRESS. FRONT TO OVERHEAD RAISES WITH SIDE TO SIDE TRUNK TWIST. STOOD-UP FRONT TO BACK SHOULDER HEIGHT ROTATIONS. STOOD-UP 90 DEG. FRONT HOLD WITH TWIST. STOOD-UP OVERHEAD HOLD WITH SQUAT. CIRCUIT ONE - EXERCISE 1-7 COMBINED. 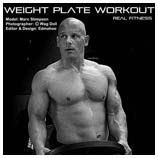 WEIGHT PLATE WORKOUT TWO - COMING SOON!